Europe has failed to see the whole picture on biofuels - turning a blind eye to the impacts of biofuel production on people and the environment in producer countries. Crop-based biofuels (otherwise known as agrofuels) increase carbon emissions, have become a key driver of forest and biodiversity loss, landgrabs and conflicts, human rights abuses, and pose a threat to the food sovereignty of vulnerable peoples. Europe's increasing demand for palm oil, driven partly by biofuel targets, is resulting in the destruction of vast areas of carbon-rich rainforests and peatlands to make way for plantations. This spells disaster for the climate and for forestdependent communities in South East Asia where oil palm is expanding rapidly. 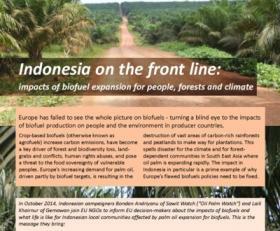 The impact in Indonesia in particular is a prime example of why Europe's flawed biofuels policies need to be fixed. Palm oil is the single biggest driver of deforestation in Indonesia,itself the country with the world’s highest rate of deforestation. Palm oil plantations now cover 13 million hectares of land in Indonesia – an area bigger than Denmark, Belgium and the Netherlands combined. The Indonesian government has made it clear that between 2010 and 2020, 14 million hectares of Indonesia’s forests will be destroyed – despite EU Member States providing economic support and engaging in multilateral agreements to protect Indonesia’s forests as wildlife habitats and carbon sinks. The expansion of the palm oil industry is propelled by rising biofuels demand - 20% of the EU biodiesel mix is now made up of palm oil mainly from Southeast Asia. Biofuels are the single biggest cause of rising palm oil imports to Europe. Palm oil imports for car fuel have increased by 365% since 2006 in fulfilment of EU biofuel targets. The expansion of oil palm plantations into forest and peatlands is the major trigger of land conflicts, which are a growing source of violence in Indonesia. Indonesian NGO Sawit Watch has identified 731 current land conflicts linked to palm oil – 53 more than just a year ago. The oil palm industry is able to exploit Indonesia’s weak legislation on land tenure to take over land which local and indigenous communities rely on for growing, hunting or gathering food. Whether by legal or illegal means, many companies are driving their plantations into areas where communities have farmed communally-held land for decades or even for generations. In forest areas, indigenous peoples’ agroforestry systems are being wiped out by the advance of oil palm plantations – despite the fact that these systems can better manage forests and help reduce greenhouse gas emissions. Many communities are strongly resisting eviction, despite facing violence, killings or criminalisation. Stories of communities whose lives are devastated by land grabbing are too rarely heard by the international community, allowing companies to continue to commit human rights and environmental abuses with little likelihood of being held to account. Even initiatives aimed at cleaning up the industry like the Roundtable on Sustainable Palm Oil (RSPO) have been unable to stop its member companies like Wilmar from involvement in illegal plantations, taking over communities' and indigenous peoples' lands without their Free Prior and Informed Consent, clearing forests without environmental impact assessments, or illegal forest burning. Biofuels drive the conversion of vast areas of land otherwise used for daily sustenance by local communities in Indonesia, threatening their ability to hunt, gather or produce their own food. Vast areas of Indonesia’s forests are crucial for providing food for local communities (through gathering, growing and hunting). An estimated 80-95 million people in Indonesia depend on the forests, including 30-70 million indigenous forest people. People should have the right to define their own food systems. Through promoting the conversion of these forests to plantations for biofuels, EU policies threaten the food sovereignty of those who rely on them most. Using land to grow crops for fuel rather than food increases the level and volatility of food prices internationally, and presents significant risks to the food security of low-income countries. By promoting land-based biofuels, the EU’s policies are indirectly exacerbating the risks of hunger for some of the world’s poorest communities. Studies have found that the oil palm plantation system has undermined the livelihoods of women and weakens their position in their communities. In rural areas, women traditionally play an important role in agriculture, rural development and forest use and management, yet often are left out of any decision-making on oil palm development. Even where women have customary rights to land, companies and government officials fail to properly consult with or consider them in the plantation land permit process: women lose their access to land. Women employed on oil palm plantations often undertake work which presents significant health hazards such as spraying chemical pesticides and fertilizers. In certain cases women and their children have been forced to work on plantations without pay to assist their husbands to meet over-demanding quotas under the exploitative piece-work system. In cases where women work on a hired basis, they often receive lower wages than men. In addition, they are expected to work on the plantations as well as carry out domestic chores and childcare, resulting in women working far longer hours. There is evidence that the rapid social changes associated with new oil palm plantations have been linked to an increase in domestic violence against women. Labour conditions in Indonesia’s palm oil sector are also poor. Sixty percent of palm oil workers are day-labourers whose wages are insufficient to meet even their daily needs. Recent research by Sawit Watch found that a plantation company operating in East Kalimantan failed to pay its labourers for two years and many were forced to leave. Carbon release from peatland drainage for palm oil is a globally significant contributor to climate change Research now shows that, when the carbon emissions caused by Indirect Land Use Change (ILUC) are taken into consideration, most biofuels do not help the climate. As well as directly demanding increased oil palm production, rising EU consumption of biofuels also squeezes the supply of land, competing with existing food and feed, leading indirectly to land conversion and clearing forests: this is known as indirect land use change (ILUC). Biofuels are the main driver of faster growth in demand for vegetable oil worldwide – demand which is largely met by expansion of new palm oil plantations, as this is the cheapest vegetable oil. Biofuels policies are therefore both directly and indirectly supporting the expansion of palm oil into forest and peatland areas in Indonesia, causing more deforestation and land conversion. This results in substantial greenhouse gas emissions from the soil and removed forests, peatland and vegetation. Extensive research now shows that when impacts of ILUC are accounted for, biodiesel that originates from palm oil, soybean or rapeseed has more carbon emissions than fossil diesel. Yet the EU's Renewable Energy Directive (RED) and Fuel Quality Directive (FQD) do not take this into account. Critical to the ILUC debate are the peatlands of Indonesia. EU research shows that by 2025 an estimated ten million of Indonesia's 22.5 million hectares of peatland could be deforested and drained for oil palm and wood pulp. Carbon emissions from peatland drainage are one of the biggest contributors to climate change. Indonesia stores 65% of the carbon in global tropical peatlands; and the large-scale destruction of these rainforests and peatland landscapes can release "globally significant" quantities of greenhouse gases into the atmosphere. Expansion of palm oil in Indonesia - driven directly and indirectly by demand for biofuel - is therefore an important global driver of human-induced climate change. Scientific uncertainty around ILUC has been used as a justification for continuing support for crop-based biofuels. But now that there is good evidence of potential serious harm, Europe no longer has any excuse for inaction. The precautionary principle, a bedrock principle of European Union law, justifies the adoption of restrictive measures to minimise risk to people and the planet. The EU’s biofuel policies are clearly failing to deliver on their key objectives to reduce carbon emissions, while simultaneously damaging people and the environment in vulnerable countries such as Indonesia. MEPs have a chance in the ‘second reading’ to improve and to see through reforms of the EU’s biofuel policy. Ensure EU support mechanisms and targets for land-based biofuels are phased out from 2020, including in the 2030 Climate and Energy Package. Rob Bailey April. 2013. The Trouble with Biofuels: Costs and Consequences of Expanding Biofuel Use in the United Kingdom. Energy, Environment and Resources EER PP 2013/01. Chatham House. Julia, Ben White Gendered experiences of dispossession: oil palm expansion in a Dayak Hibun community in West Kalimantan, as above. See The Oil Palm Plantation System Weakens the Position of Women, Sawit Watch and Women’s Solidarity for Human Rights, November 2010. See, for example, Enough is Enough!, ICTJ, the Women Commission, and the Women Working Group of Papuan People Assembly http://ictj.org/publication/enough-enough-testimonies-papuan-women-victims-violence-and-human-rights-violations. Marelli, L., D. Mulligan, and R. Edwards. As above.